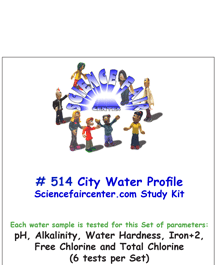 City Water Profile Rust Tests staining from natural water or old plumbing. City Water Profile Rust Tests staining from natural sources or old plumbing. Good science fair project experiment for city neighborhoods with older buildings and plumbing. Testing only takes a few minutes per sample. Each water sample is tested for this Set of Parameters: pH, Alkalinity, Water Hardness, Iron+2, Free Chlorine and Total Chlorine (6 tests on each water sample). Contact Us at: info@schoolsciencekits.com Please email us your questions and mention something about the students project, grade level, your question and if you want us to call…phone number. Testing for Iron in tap water is very common and is very quick. Each test strip result indicates the presence of Iron in the ferrous (Fe+2) state in water. The color chart for this test allows you to read Iron+2 in milligram/L or ppm. The presence of Iron in water contributes to the reddish brown stains on porcelin and plumbing fixtures. It can also add a metalic taste and odor to drinking water. 0.0, 0.1, 0.3, 1.0, 5.0 milligms/L or ppm. (Note: concentration units are milligrams per Liter or parts per million). Best results are obtained when water is room temperature. Results are obtained from this test in 2 1/2 minutes. drinking water from a city water treatment system. 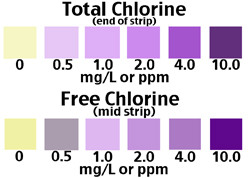 This dual test is a convenient way of monitoring Total and Free Chlorine. Contaminant Level (MCL) as recommended by EPA. City water shows signs of rust and staining from natural sources or old plumbing.